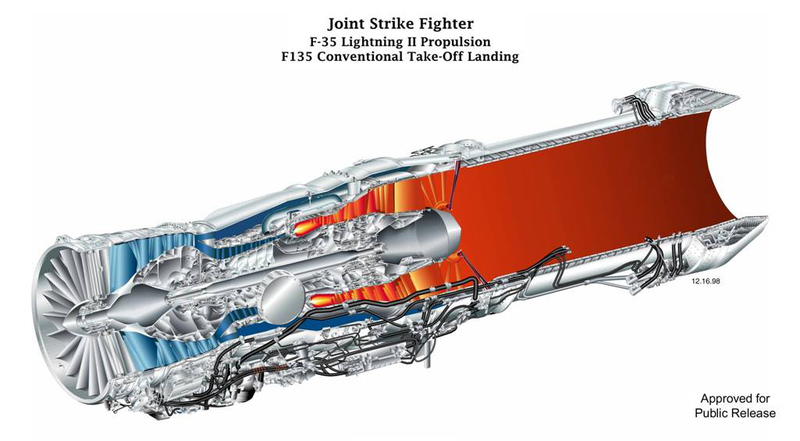 Pratt & Whitney's F135 propulsion system is the engine of choice for the F-35 Lightning II, fifth generation, advanced, single-engine tactical fighter developed by Lockheed Martin in conjunction with BAE Systems and Northrop Grumman. 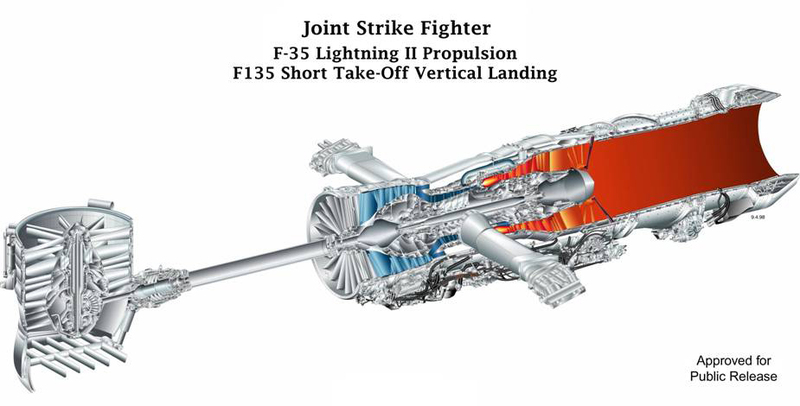 Pratt & Whitney’s F135 propulsion system powers all three variants of the F-35 Lightning II fighter aircraft - the F-35A CTOL (Conventional Takeoff and Landing), F-35B STOVL (Short Takeoff and Vertical Landing) and F-35C CV (Carrier Variant). The affordable, available, adaptive F135 is the world’s most advanced fighter engine, delivering more than 40,000 lbs. of thrust and unmatched advances in safety, design, performance, and reliability. The F135 has evolved from the proven F119 engine, which exclusively powers the U.S. Air Force's F-22 Raptor, and features best-in-class single-engine reliability, fifth generation stealth capabilities as well as advanced prognostics and health management systems. The F-35 is the first truly international fighter aircraft development program – developed to serve the United States, the United Kingdom, Italy, the Netherlands, Turkey, Canada, Australia, Denmark, Norway and other allied nations. Pratt & Whitney has partnered with the best aerospace companies in the world to manufacture critical components of the F135, with the goal of producing the most advanced propulsion system while providing value to F-35 customers around the world. Since powering the F-35’s first flight in December 2006, the F135 has maintained high readiness levels that have enabled the program to meet flight test objectives and support operational requirements for all three aircraft variants. Supportability features are designed to offer ease of maintenance while achieving unprecedented engine reliability and maintainability. Networked maintenance and logistics support capabilities are projected to significantly lower maintenance costs and increase mission availability. Similarly, common sustainment solutions across the U.S. armed services and partner nations offer economies of scale targeted to lower long-term costs relative to current engine fleets. The F135 propulsion system for the fifth generation F-35 Lightning II continues to redefine what's possible for customers, but Pratt & Whitney is not stopping there. We stand ready to take the world’s most advanced fighter engine to the next level with growth options to keep customers ahead of evolving threats. Pratt & Whitney’s growth options for the F135 incorporate next generation propulsion technologies that offer improved thrust and fuel burn as well as power and thermal management capacity to meet the demands of future mission requirements. Learn more: adaptivengines.com.